Trump says Mexico began to detain thousands of Central American migrants at its southern border only this week. Let’s not beat around the bush here — that’s totally false. They’ve been doing it for decades. The president also claims Mexico has the strongest immigration laws in the world. Experts sharply disagree. Mexico does have penalties for immigration violations, but it decriminalized the act of crossing the border in 2011. Contrast that with the United States — where unauthorized entry is a misdemeanor for first-time offenders and a felony for repeat offenders — and Trump’s claim falls apart. The claim that Mexico only this week started to detain thousands of Central Americans at its southern border is nonsense. Mexican immigration officials had 886,640 encounters with Guatemalans, Hondurans and Salvadorans from 2011 through February, according to data from Mexico’s Department of the Interior (SEGOB). Fifty-three percent (472,249) happened at the four Mexican states that border Central America: Campeche, Chiapas, Quintana Roo and Tabasco. The statistics also show that from 2001 through February, Mexico recorded 2.15 million deportations of people from El Salvador, Guatemala and Honduras, the three countries in the Northern Triangle driving the Central American migration phenomenon. Let’s compare deportation numbers from 2013 to 2018 in Mexico and the United States, looking only at people from the Northern Triangle countries. Mexico’s total: 692,199. The U.S. total: 550,186. The Mexican figures are in calendar years, and the U.S. figures are in fiscal years. The point is that these are huge numbers for both countries. In the first two months of 2019, Mexican immigration authorities had 16,331 encounters with people from the Northern Triangle countries, 60 percent in Mexico’s southern border states. Mexico returned 13,281 individuals to the three Central American countries in the same two-month period, according to SEGOB data. Mexican Foreign Minister Marcelo Ebrard held a news conference on the same day Trump made these claims. Immigration policy has been consistent since President Andrés Manuel López Obrador (AMLO) took office in December, Ebrard said. “Ebrard says he has NO idea WHAT caused @realDonaldTrump to praise Mexico’s migration policy today, saying it has been consistent since AMLO took office and based on registry of arrivals, respect for human rights,” a Bloomberg News reporter tweeted. Neither the White House nor the Mexican Embassy in the United States responded to our questions. The Washington Post’s Mary Beth Sheridan reported that apprehensions in the United States have been soaring recently, despite controls along Mexico’s southern border, which suggests more Central American migrants are getting through Mexico to the U.S. border. Interior Minister Olga Sánchez Cordero [of Mexico] announced recently that authorities would deploy security forces to form a containment belt across the Isthmus of Tehuantepec, Mexico’s narrowest point, about 200 miles north of the Guatemalan border. Mexico’s most audacious step might be its agreement to become a sort of waiting room for migrants as they go through the process of seeking U.S. political asylum. That’s part of a Trump administration program known as the Migration Protection Protocols. “This is a radical change in Mexican foreign policy,” said Jorge Durand, an immigration expert at the University of Guadalajara. Trump also claimed Mexico has the toughest immigration laws in the world. Does it? Laura González-Murphy, who advised officials in Mexico’s National Congress while the 2011 law was being drafted and wrote a book about the process, called it an “extremely humanitarian” policy. “It made the rights of migrants a priority,” she said. As we’ve explained, though, things changed dramatically in 2011, when Mexico’s sweeping immigration law was enacted. 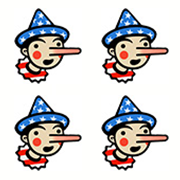 Aside from decriminalizing the act of entering Mexico, the new law “allowed undocumented immigrants to use education and health services” and “set criminal penalties for abuse of migrants by immigration agents,” as PolitiFact found. “It should be noted that in reality the Mexican government has struggled to implement the law — both the enforcement aspects and the respect for human rights — because the immigration agency is chronically underfunded and riddled by corruption,” Selee said. It’s not surprising to see Trump trample over basic facts about immigration in Mexico. After all, the president routinely makes unfounded claims about the U.S. immigration system. The Mexican government says it’s tightening security in a key area 200 miles from its southern border, but Trump makes a far different and demonstrably false claim: that Mexico began detaining Central Americans by the thousands only days ago. Mexico has deported Guatemalans, Hondurans and Salvadorans more than 2 million times since 2001. The claim that Mexico has the toughest immigration laws in the world is just as easily debunked, considering that U.S. law treats unauthorized entry as a criminal offense, while it’s only a civil violation in Mexico. These are not your average falsehoods. They’re easily worth Four Pinocchios. "Mexico, as you know, as of yesterday, has been starting to apprehend a lot of people at their southern border coming in from Honduras and Guatemala and El Salvador. And they’ve — they’re really apprehending thousands of people. And it’s the first time, really, in decades that this has taken place. And it should have taken place a long time ago." "You know, Mexico has the strongest immigration laws in the world. There’s nobody who has stronger. I guess some have the same, but you can’t get any stronger than what Mexico has."